Heat and Control 's Multi-Zone Fryer system promises to produce potato chips with a lighter, more uniform colour. Oil is introduced and removed at multiple points along the length of the fryer pan to provide accurate control of oil temperature and product flow. This assures all chips receive the same exposure to oil for uniform cooking. It also permits lower frying temperatures which produce lighter colour chips. By controlling oil temperature in separate zones, processors can use the same fryer to produce chips with different texture characteristics. Heat and Control says it has everything needed for processing and packaging of natural and fabricated potato chips, sticks and snacks. From truck or crate unloading, through storage, peeling, washing, frying, seasoning, conveying, weighing, bagmaking and controls, complete systems are available for 400 to 6,500 finished pounds per hour. 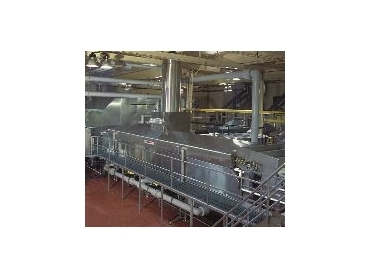 Oil stripping systems are available to reduce finished potato chip oil content as low as 18%. Batch frying systems are also available.